This discussion is brought to you by The Honest Company. As always, I only share what products I love and use with you! I was recently asked to try out a few new cleaning products and see if I’d choose to “make the switch”. The products were from The Honest Company, which I actually first heard of for their baby wipes and diapers program they offer. I never have been really “particular” about the type of cleaning chemicals I use in the home. However, because of that reason I find it hard to find time to clean areas like the bathroom where I’m using such potent and strong chemical-based products because I usually have baby girl around the area. For that same reason, I dread cleaning bathrooms because the strong smell of the products give me a headache usually. I always have to have windows open and fan going after I do big cleans from all the bleach smells from doing the shower, floors and counters. Once I read about all the benefits of using The Honest Company’s cleaning products I was excited to see if I would actually make the switch and stop using all the previous cleaning products I use and if I’d stick with theirs. These products are designed to be safe and sustainable, while being beautiful, fresh, and fun. Mostly I wanted to be sure that (1) they did clean as well as I was used too, (2) I felt like they cleaned as good and (3) it helped eliminate the issue of strong odors. Our second bathroom belongs to our son J and eventually Kenzie will be using it as hers as well. So the idea of “friendlier” cleaners makes me happy when it’s their tiny hands that touch all the surfaces. The surfaces that get dirty the fastest, as usually, the sink, counter, toilet and bathroom. The sink is ALWAYS covered in toothpaste, as my son is big on doing it himself… and doesn’t always end up in his mouth. There is always water spots all over the counter and just the usual build up. He takes a bath a lot and I’m big on making sure no grim builds up in there from the bath. As I started to clean with the Honest products I was instantly surprised at how pleasant they smelled!!! No harsh chemical smell, they actually had a nice scent of Eucalyptus Mint to them. After I cleaned the surfaces with them I was happy to that the surfaces felt clean too. My hands didn’t get as dried out as they do with the other products too. In addition to the bathroom cleaner, and floor cleaner I also tried their Bubble Bath for my son’s routine baths. Can you believe I actually NEVER let him have bubbles in his baths? I’m not big on them mostly because when he was a baby he had super sensitive skin, and then as he grew up I just didn’t like the leftover soap film they left in the bath. But I was very happy with their bubbles. They smelled fresh and I didn’t feel they left a film in the bathtub either. My son was VERY happy to have bubbles! So ultimately the question is, will I be tossing out the harsh cleaning products I’ve been using and keeping the new Honest cleaning products? I do believe I will be! The Honest Company was started by a mom and dad that wanted something better in their home, something that was more natural, and non-toxic and something that looked as beautiful as it felt in your home. They have a WIDE variety of products, but ones that you can use daily in your own home. Anything from cleaning products to your baby wipes and diapers. They also have a full line of baby products that you’ll feel safe using on your bundle of joy. You can get more information and sign up for a FREE trial of diapers and wipes here. You can see more about their cleaning products and get a FREE trial here. Want some more goodness? You can sign up for their email content here. You can get $10 off a $40 purchase at The Honest Company using code: $10off$40Pollinate ! (Limited to first-time customers and one use per customer. You can keep up with The Honest Company on Twitter, Facebook, and their Blog. This is a Sponsored post written by me on behalf of iBulb. All opinions are 100% mine. I absolutely love working with reclaimed wood and this project was super easy to do! I’ll admit right away that this is more of a "reclaimed wood vase ‘holder’” as you couldn’t fill a wood vase with water for your flowers. So unless you use faux flowers, you can build this vase and inside it place a slim vase or glass that you’ll actually fill with water for your flowers which is what I did. I used a broken apart pallet for my reclaimed wood. If you can find a traditional size pallet, typically the length of one board is 40” and the hubs cut the board down to four equal parts about 10” each. Then I aligned the cut boards to make a box and used painters tape to hold the boards in place. The tape won’t stick to your boards, but if you wrap it around enough the tape will be tight enough and stick to itself. Next I used a 1/8th inch drill bit and pre-drilled two holes on each side near the bottom, and top of the “box”. You want to pre-drill to prevent the wood from splitting. I used #6 1” screws to attach all four boards together. By using #6 screws they have a smaller head width to them which will make it easier to prevent splitting in the wood. After it was all attached I removed the painter’s tape and gave it a quick sand with my orbital sander. I didn’t sand it down too much as I really wanted the reclaimed woods characters to show when I stained it. I just did a light sanding to remove any splintering wood and give the bottom an even surface. I almost ALWAYS use Minwax stain in Provincial anytime I stain wood. If you’ve never stained wood before, doing a project with reclaimed wood is PERFECT as you really can’t screw it up. With a smooth finish wood you really have to stain in one direction and follow up with a rag quickly to give an even coat. But with reclaimed wood the stain soaks up evenly on its own and I rarely have to follow up with a rag. You really can’t go “wrong” staining reclaimed wood, it’s mistake proof so if you’ve been nervous to try and stain something – this is a perfect first try! Once the piece is completely stained just let it air dry for a few hours in a well ventilated area. I love the character of it! I placed a narrow glass inside it and filled with water to hold my beautiful lilies I picked up from our local flower shop. I LOVE lilies! They are such big beautiful flowers that make an impact in decorating. I made a small bouquet of white and pink lilies and grabbed some filler of greenery and baby breath. Decorating your home with fresh flowers is such a refreshing way to bring in color, plus they smell great too! I love the big size of lilies and I love that within one bouquet the flowers will bloom at various times making the arrangement look different daily. Many people think the scent of lilies can be strong and sometimes those that have allergies can be sensitive to lilies. But did you know that if you remove the anther (that fluffy pollen pod) it’ll prevent those that have a sensitivity to pollen. In addition it’ll help keep the pollen off your furniture, clothes, etc which it may stain. Anthers are easily removed by gently pulling away from the filament. Don’t use scissors to cut the anther or this will leave a short stubby filament. Welcome spring into your home with your own big beautiful bouquet of lilies and adorn them in your own reclaimed wood vase! You can pick up lilies really in any local flower shop near you, even your local grocery store or garden center. The other day I shared my to do list for the outside of our home. The to do list doesn’t stop there. Inside the home we have a lot to do to jump start our summer too. Declutter - Out with the old. It’s time to box up, donate, and get rid of all the extra things that have stored up over the past year. Each room will be attacked, including the attic and garage. Deep Clean – I want to do a thorough clean of our house to get rid of all the winter germs, and start the summer off fresh. Organize – Once everything is clean, it’s time to organize and find a spot for everything. It’s easier to stay organized and clutter-free when everything has a spot to go. Check the details – It’s a good reminder as the season changes to be sure your home is up to date on safety and health features. Change your air filters, check your smoke and carbon monoxide detectors, and check your fire extinguisher. You can also find a local company that can do a check on your water heater, and HVAC system or air conditioner to make sure it’ll work properly during the hot summer months. Another good idea is to check your exterior water lines for any damage that may have occurred over the winter. I was recently asked to try out SC Johnson’s latest innovative product that makes cleaning a breeze, the Smart Twist™ cleaning system. When I saw that it was one unit that combined three awesome cleaning products I knew it was going to save me time, and money so I was all about it. Curious what this awesome gadget is? With the Smart Twist™ Cleaning System, you have three amazing cleaners in one convenient and easy to use sprayer and you are ready for any room. Twist, Spray, and Wipe and you are ready for the next surface. You are in, out and back to what you really want to do. And that’s exactly why it saves you so much time! Kitchen/Bath $24.99: The Sprayer plus one each of Windex® Glass Cleaner, Scrubbing Bubbles® Bathroom Cleaner and fantastik® Kitchen Cleaner concentrate cartridges. 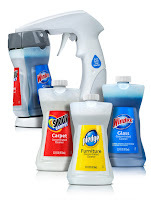 Living Space $24.99: The Sprayer plus one each of Windex® Glass Cleaner, Pledge® Furniture Cleaner and Shout® Carpet Cleaner concentrate cartridges to fill the system. A “Cover Every Base” Pack $34.99: You’ll get the Sprayer, two Windex® Glass Cleaner concentrate cartridges, and one each of Scrubbing Bubbles® Bathroom Cleaner, fantastik® Kitchen Cleaner, Pledge® Furniture Cleaner and Shout® Carpet Cleaner concentrate cartridges. In addition you can buy 2 replacement bottles for $7.99, or 3 for $11.99. I was excited to receive the “Living Space” bundle, which is perfect for so many areas in my home. It was the perfect reason to give my office space a thorough cleaning which has been needed for a while. My son has been dying of excitement to try this out since I opened the box (which is always a plus to have him helping out!). What I loved most is how convenient it is to have three of my most loved cleaners in one handy unit. My office space is upstairs so instead of hauling a tub full of cleaners I can just grab the sprayer and some paper towels and I have no excuses not to clean. Windows, desk, and carpet all cleaned in under five minutes. Not only does the Smart Twist™ save you time and money, but SC Johnson is making your cleaning ways more earth friendly. Each bottle is 25% post-consumer plastic and uses 64% less plastic than a standard trigger bottle. By using the concentrate version of your favorite cleaner you add your own tap water and is equivalent to the standard trigger size bottle. Please visit SC Johnson Smart Twist™ Cleaning System's webpage HERE to learn more and to purchase your own system! This post is sponsored by SC Johnson and I received the mentioned product to review. As always, all opinions are mine and I only share products and companies I truly love! Spring has sprung in this part of town and my spring cleaning to do list has already gotten pretty long! Not only do I have the usual cleaning to do inside (by the way I’m getting ready to show you guys some new awesome cleaning products I’ve been using, super excited about them), but I have LOTS to do outside. Being a homeowner can be a LOT of work and not always glamorous and fun! I wanted to share my home maintenance to do list with you in case it sparked any ideas to help you keep your home looking extra nice on the outside. First my sad sad little garden in the front. Can you even call it that? I need to figure out this year what to do with it, I’ve never found flowers that work well combined with the already-there bushes. Plus, see that red dotted line, that’s where the garden border is supposed to be, however weeds have taken over. I also have to get to the store and pick up some mulch before it’s too late! Next, our garage has taken a beating. Not sure what caused our paint to chip so bad because our neighbors (house built around the same time) isn’t nearly as bad. So I’ll be taking a sanding block to it and giving it a new fresh paint of coat. Here’s where I start getting REALLY embarrassed. Do you see all that filth? YUCK! Nastiness of all shades and textures have started growing on our siding and it needs to get blasted off with a power wash. I’m keeping my eyes on Groupon for this local company that runs specials that I’ve heard does an awesome job. That’s one project I’m not willing to risk DIYing it wrong, pressure washers can be intense. But our house needs a good scrub. The front door needs a little paint touching up too. I’ve been tempted to maybe try a new fun color, but our house siding is this pale yellow color, and the shutters and front door are this deep maroon. I haven’t really been able to choose a color that’d match the yellow nicely, or even the shutters if I wanted to just have the door be a feature piece in a different color. What do you think? And going hand in hand with the filth that grew on our house, our backyard fence needs a good bath too. ICK I can’t stand that type of mildew/mold whatever it’s technically called. Luckily we’ve been having AWESOME weather so I really hope to get these projects done soon and have a squeaky clean house soon. I’ll have some tips for cleaning the inside of your home soon too, including improving your air quality. I also may be prepping for a garage sale too… time to clean out the attic. Since I’ve embarrassed myself a lot already showing the filth that is the outside of our home, I wanted to share one of my most hated parts of our home. Pure embarrassment. Everyone, meet our sorry excuse of a back patio. A concrete slab, mismatched patio chairs, a free curb alert table, and Jackson’s toys thrown about with a HVAC system loud and in charge. (I hang my head in shame). How often do you stare at a wall in your home, knowing you want SOMETHING there but no clue what. There’s always a million options, a piece of art, a gallery wall, shelves, a piece of furniture, your kid’s boogers (oh wait that is what’s there already). Well our stairwell, and upstairs hallway has always been that place for me in this home. At the very top of the stairs there’s a wall space that you stare at coming up the stairs and it drove me insane being just this blank wall. But it also is the end wall of a very long hallway, so I didn’t want to do a big gallery wall as I may do something along those lines down the hall eventually. So I decided to do some wood working and try my hands at a very well known shelf tutorial, Ana White’s $10 shelves. I think it turned out great and creates such a feature piece now that holds a variety of pieces I love to look at like our family pictures, some of our favorite Beatle lyrics, and a classy vintage mirror. It also conveniently hides our ugly thermostat too! These things are CRAZY easy to make! Her instructions are super simple and easy to follow, I just made one change when I made mine. I used my Kreg Jig to be sure the strength of the shelf would stand the test of time. I wanted to make a long shelf to fill the space and have it come out from the wall about 4”. The amount of frames I’d putting on it I was a tad worried about that weight causing the boards to separate over time, so I just used my fancy shmancy Kreg Jig to have it be extra strong. It’s 6 feet long, 4” wide and I painted the finished piece Ivory Lace from Sherwin Williams (my favorite almost white paint color). I love the depth of the shelf, it lets me layer pictures and signs to add even more appeal for the eyes. 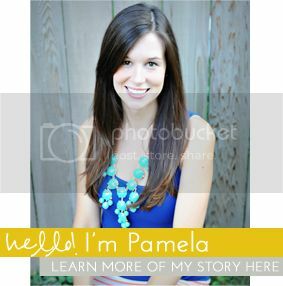 It’s already time to update the pictures though! Baby girl needs to get up there with us! I also made two smaller versions of these for Baby Kenzie’s room too and just stained them for a more rustic look. What do you think?? Do you have any blank wall space you think you could whip these shelves up for? Recessed lighting can be a great feature to have in a home, especially in the kitchen. It’s a convenient way to provide a lot of light without taking up space. We have a good size kitchen with lots of open space and within the kitchen area we had 6 recessed lights so that’s quite a bit of light for an open layout. This allowed us though to play with the idea of changing out some of those recessed lights and replace with hanging pendants for more feature pieces during our kitchen makeover. We had the perfect spots for them too, two above our breakfast bar, and one above our kitchen sink. You don’t need to have any previous electrical experience to change out a recessed light to a pendant because there are converter kits on the market that make the process super easy. Plus, I’m gonna show you how we did it step by step! Keep in mind that each kit may vary slightly, and your specific conditions may vary from mine. But generally, each step should be about the same. Remember safety first! Cut to off the electricity to your lights before you begin. Removing the can from the recessed light is easy, just pry it down slightly from the ceiling and you’ll see two metal clamps that you’ll want to pinch, and then pull down. The whole can part will come down and then you’ll see on the light bulb attachment piece, two more clamps. Push those and you’ll be able to remove the outer can piece. From the kit, screw in the wire set that has the light bulb attachment piece. One end will screw into the light bulb piece, the other will have a metal clasp on it. This piece is what you’ll screw into the side of the metal can that’s recessed in the ceiling to keep everything upward. This next step was what we found to be the easiest to install the ceiling attachment piece. We held up the part that screws into he ceiling and made three marks evenly spaced around the piece. Next using a 1/8th drill bit (teeny tiny one) we pre-drilled the marks we made. The reason we did this step wasn’t for the anchors we were using but double checking we were going to be able to completely drill in those spots. Each can light has a metal box that’s attached to it that houses all the electrical wiring. Where that box is located can vary light to light so there may be a few spots that you wouldn’t be able to screw an anchor into because you’d hit the box. Doing these pre-drills double checks that we have the all clear and won’t run into any problems. The kit comes with the anchors pictured on the right. For these ones you have to predrill and then push the anchors inward and they pressure out to “anchor” the screw when inserted. However, I typically use these EZ anchors whenever I can. They’re heavy duty, plus super easy to use. You just use a standard screw driver to screw them in and that’s it. So, we swapped out the provided anchors for these EZ Anchors. Next attach the wire set from the provided kit and plug into the piece that you previously attached to the side of the can. This has three coated wires that have exposed ends, and these are what you’ll attach your light fixtures wires too. TIP: The kits cover comes white, but we painted it the same color as our ceiling to help blend in the unit. Next, use the provided parts from your light fixture and the piece that would attach to the ceiling , you attach to the cover piece of the converter kit. These steps will vary depending on your specific light fixture, but just follow the instructions for your specific piece and it should be easy to understand. You’re almost done, just connect the proper wires and attach the cap! And after: I think the hanging pendant lights really fill the space, and help bring the space together! Pretty easy to do especially for not needing any special electrician skills. Again, remember to play safe and turn off the power to your lights, and then of course once you’re done to turn it back on. Do you agree? Do you think changing out the lights was a good idea for our space?